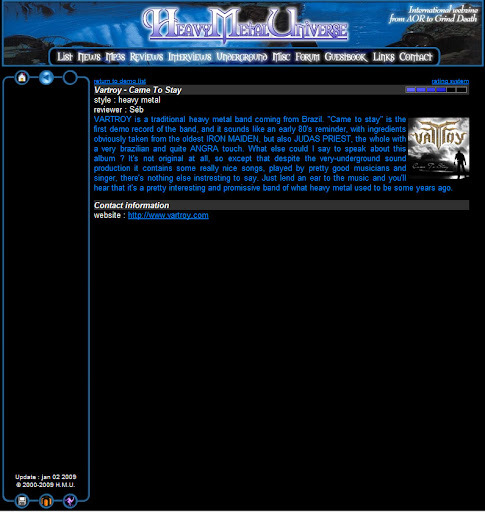 O site francês, Heavy Metal Universe, publicou um bom review do cd CAME TO STAY. VARTROY is a traditional heavy metal band coming from Brazil. "Came to stay" is the first demo record of the band, and it sounds like an early 80's reminder, with ingredients obviously taken from the oldest IRON MAIDEN, but also JUDAS PRIEST, the whole with a very brazilian and quite ANGRA touch. What else could I say to speak about this album ? It's not original at all, so except that despite the very-underground sound production it contains some really nice songs, played by pretty good musicians and singer, there's nothing else instresting to say. Just lend an ear to the music and you'll hear that it's a pretty interesting and promissive band of what heavy metal used to be some years ago.